Welcome to The Game Plan! The AMX 50 B is a glass cannon if there ever was one, but in the right hands, its speed and burst damage capabilities mean it can be absolutely deadly. Caviar from Korean team DarkWolves is clearly an expert with this unique French autoloader, so if you want to have your enemies quaking in their boots whenever you approach, you won't want to miss his play-by-play guide! The AMX 50B is a French Tier 10 heavy tank. With its 4-shell magazine, it can be a very powerful damage dealer in line combat. In this article, I’ll be explaining how to enhance the AMX 50B’s performance, together with brief explanations and video. 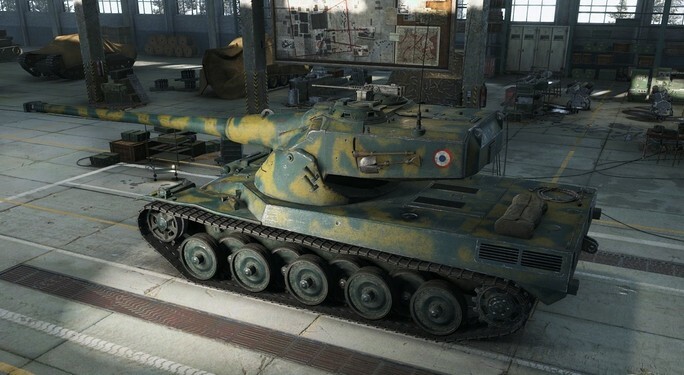 The most remarkable features of the AMX 50 B are its reliable French autoloader and high mobility. The gun, with intervals of only 2.5 seconds between shots, gives you the advantage when exchanging fire. And as the fastest heavy tank in the game, it can be the first to get into advantageous positions, or make a quick escape if necessary. The thrill of being able to ram your enemies is a bonus. There are other Tier 10 medium/heavy tanks that use auto-loading guns like BC25t, T57H, and the new T50/51. But the AMX 50 B is a bit different from these. It needs 0.5 seconds longer between shots and 5 seconds’ more reload time than its rival T57H, but has superior mobility and gun stability. It shows higher penetration and damage per clip than the T50/51 and has a lower damage per clip than the BC25t. But with advantages like 0.27-second shorter shot intervals, way faster reload, higher gun stability, and an oscillating upper turret, it’s clear why this tank is great in line combat. Above all, it can equip APCR shells for 4,800 credits, which can make a huge difference. The AMX 50 B is certainly a versatile tank – it easily covers multiple roles, playing damage-dealer or formidable support with ease. This has made it quite a popular choice both in clan wars and tournaments, and there are many players who love this tank. But along with versatility comes ambiguity. It’s not as mobile as a medium tank; its armor is weak, so it can be suicidal to confront an enemy tank one-on-one; and its low camouflage rating can sometimes be a big problem. Because of this, this tank was unpopular for a while, but to overcome its shortcomings is a challenge worth taking on indeed. Watch the video below and read the accompanying guide to find out how! Considering the characteristics of the map Swamp, there might be chances to encounter a lot of medium tanks at K1. But since there aren’t any medium tank platoons, it should be worth heading that way. 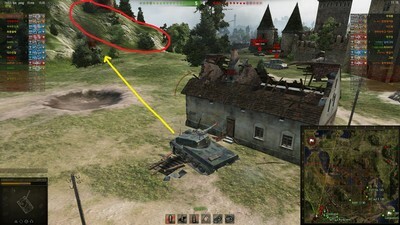 You might also think it’ll be possible to head towards the B0 line, but while heading upwards, you could get spotted and shot (see the yellow line). This is a path that medium tanks will tend to avoid. With help from a scouting 13 90, I’ve learnt that an enemy medium tank is coming. 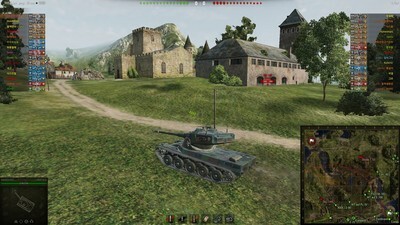 And in the C6 area, there are enemy medium and light tanks waiting to collect tolls. So, if I’d headed that way, it would’ve been a disaster. I’ve spotted another enemy medium tank that the 13 90 didn’t spot. I was already thinking of running away after using 1 clip. This is the shell evasion movement for autoloaders. I’ve succeeded in nailing 2 clear shots without being damaged. The 2.5 second shot interval was probably an advantage here. 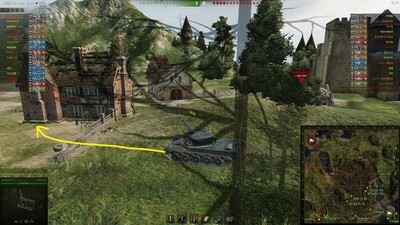 Additionally, with the excellent aiming of the AMX 50 B, I was able to minimize the HP damage. It’s a great skill to practice. Was planning to run away, but after noticing that the enemy tank 140 was busy dealing with another tank, I’ve decided to stick around. Since the enemy has disappeared off my radar, I head to a more advantageous position (so as not to get hit by the artillery). 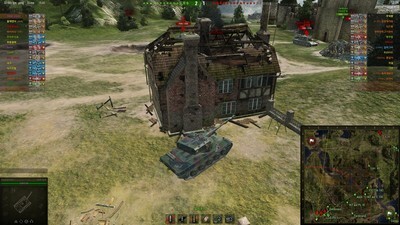 As the enemy 140’s HP is only 1100, I finish it off quickly and hide behind the building. By staying in that position, approaching enemy tanks are forced to leave their sides completely exposed, and I can reverse into cover as necessary. Although I’m using credit shells, also using premium shells would make it easier to successfully track your enemies’ sprockets. This can be important in supporting your position. 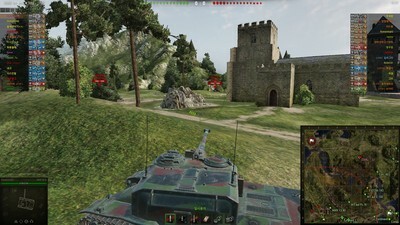 I’ve realized that an enemy IS-3 is closing in. But since the IS-3’s HP is only 1500, I didn’t panic: I dealt with it in 1 clip and maintained my position. If it had been a Tier 9/10 tank or a Tier 8 Heavy tank, I would’ve used all 4 shots and run away as fast as I could. Or just running away earlier would’ve been a nice solution. It’s time to clean up the remaining tanks. 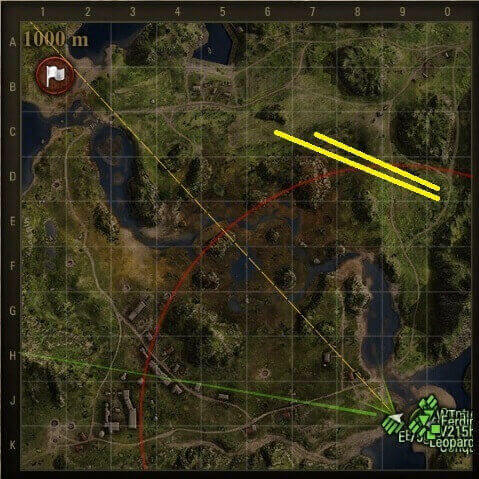 Start where indicated by the yellow line, so you won’t get attacked by the artillery. 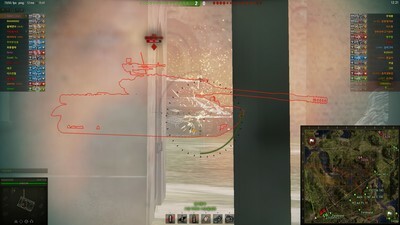 Because of the hill (circled in red), it’s hard for the artillery to get a clear shot at you. In the video you’ll see the Leopard 1, which is on the enemy’s heavy tank line, vanish along with the T92. So, after clearing the area, I decide to return to base and defend it. Swamp is a map that is more advantageous for defense. Especially for a tank like the AMX 50 B that has almost no camouflage ability. From this point on it’s pretty easy to defend. Seems there’s nothing else that needs to be explained. In brief, the way to play the AMX 50 B is to move-shoot-shoot-move-shoot. It’s fairly easy when it’s explained this way. To maximize this ability, the crew skills and perks should be Sixth Sense/Snap Shot/Smooth Ride/Safe Stowage/Brothers in Arms. It only takes 2 skills to learn all of them, so it’s quite simple. I personally think there is no need to have fast Repair skills. For consumables, using Strong Coffee would be a good choice. You can dominate the line with the AMX 50 B. And if you also have the ability, you’ll be able to dominate the whole game.